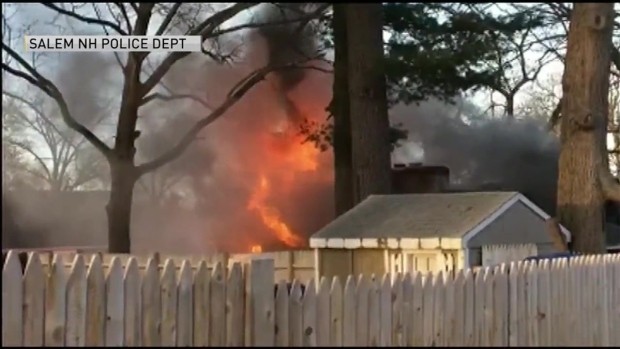 Firefighters in Salem, New Hampshire, had to battle a massive house fire following an explosion on Monday evening. A massive fire following an explosion destroyed a New Hampshire house Monday evening after authorities went to the condemned property to investigate a report. The fire at 20 Irving St. in Salem was so intense that at least eight neighboring homes had to be evacuated as a precaution. Salem police say they first arrived at the scene just after 5 p.m. for reports of a dispute between neighbors and activity inside the home. The home on the property had been previously condemned by city officials, according to authorities. A vehicle was seen in the driveway of the home and when officers attempted to make contact, no one inside answered, police said. Firefighters battle a house fire in a residential neighborhood in Salem, New Hampshire following an explosion in the house. Officers then heard a hissing noise and smelled the odor of gas. While backing away, they heard a loud explosion and the windows blew out of the house. Police said the house then began to smoke and eventually was engulfed by flames. Firefighters then arrived on the sene to douse the flames, which could be seen shooting from the home. Salem Fire Chief Paul Parisi said following the explosion, multiple rounds of ammunition could be heard going off inside the home, to which neighbors attested. "You could hear that ding, that sound of bullets going," said neighbor Suzanne Redfern. "And you could hear a lot of it them. And then they made us leave." Officials say it's unclear if anyone was inside the home at the time of the explosion and subsequent fire, and the name of the owner of the condemned home has not been released. Investigators plan on entering the remains of the home on Tuesday morning after hot spots are put out through the night. "We just don't know what we're going to find when we get inside that home," Parisi said. No first responders were injured in the incident. Onlookers nearby said the smoke was also intense. "It was black when we looked up in the sky, but it just covered," described one nearby resident. "Like when people have bonfires and it spreads. That's how it was."